For the past six months I have crisscrossed the Commonwealth introducing myself and MASSCreative to the leaders and supporters of the Massachusetts creative community. I have traveled to more than 40 communities and have personally introduced MASSCreative to more than 400 arts and cultural leaders. Entering into this passionate and energetic group of people gives me optimism and hope that MASSCreative can provide the structure and opportunities to build a powerful and robust movement for the Commonwealth’s creative community. Just this week, I met with a group of leaders from the South Coast at the Attleboro Art Museum. I heard from its director Mim Fawcett about the museum’s programs and the impact it has on their community. I also connected with Sherye Weisz whose SMARTS Collaborative has been on the forefront of advocating for strong arts education programs in the region. 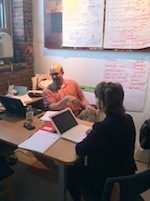 I then traveled out west to MASSMOCA in North Adams to meet 45 leaders from the creative community in the Berkshires. I heard about how arts and culture is one of the major drivers for the vitality and robustness of the local economy and towns. I stopped in to the Franklin County Chamber of Commerce in Greenfield and met with local leaders including Events Coordinator Director Becky George who talked about how the creative economy is keeping Franklin County buzzing. It is clear that the creative community in Massachusetts is a key to building vibrant and connected communities. While we have made progress, there is more to be done. Broadcast the stories on how creativity is a necessary public good that helps our communities thrive into vibrant and connected places to live. Build the political power of the creative community by organizing the sectors leaders and engaging our audiences in our campaigns. MASSCreative will provide the opportunities for everyone to take some responsibility for the creative community and take a step into the public realm and engage with our political leaders. As we tour across the Commonwealth over the next month, we will set out to engage the leaders of our community from across the Commonwealth and come together as a unified voice. Even more important, we will work hard to engage our hundreds of thousands of followers and audience members who are inspired and supported by our creative work. I hope to see you either in Worcester on October 1stor at one of the regional kickoffs that will follow.